I’m not a great believer in ‘rules’ for writing. As W. Somerset Maugham apparently said, ‘There are three rules for writing a novel. Unfortunately no one knows what they are’. That said, I’ve been given some advice that has helped me to write – not rules as such, more ways of thinking about your writing. These are some that I found helpful, but really it’s about finding out what works for you. Some people plan every chapter out beforehand and then write the whole book in order from beginning to end. Others start writing with no idea of where they’re going to end up. Some know the ending but not how they’re going to get there. Others (and I’m one of these) write bits of story in the wrong order and then fill in the gaps and create the whole story at the end. Some take weeks, some take years. Some write 1o00 words every single day. Some write sporadically. There is no right way to do it. You just have to find out what works for you. Don’t try and make it perfect first time. I’m terrible at taking my own advice on this. I always want to get it right first time. It’s impossible though. Allow yourself to get it wrong, to experiment, to make mistakes. No one else ever needs to read your first draft. That’s where you find out what the story is, and who your characters are. The bits you don’t like help you to work out the right way to do it. Cringe-making cliches and terrible dialogue and unrealistic characters are familiar features of every first draft and easy to put right later. One of the best pieces of advice anyone ever gave me was ‘Don’t send your work off to anyone before it’s ready’. Writing a story takes time. Making it into a good story takes longer. Making it into the best story it can be can take a really long time. Don’t rush. If you know something doesn’t quite work, don’t ignore it. Put the manuscript away for a while if you can. Coming back to it after a break can make it clearer what you can improve and how. It can feel frustrating but, in my experience, patience and determination to make your writing as good as it possibly can be pay off. Don’t try to write a book everyone will like. There is no book that everyone likes. Think of your very favourite book. There are many people, many of whom you probably like and respect, who do not like that book. Just write the book you want to write. If you try to please everyone you’ll play it safe, compromise and end up writing something bland that runs the risk of no one liking it. Believe in your idea and accept that it won’t be for everyone. Don’t try to follow trends. Write from the heart. If you try to follow a trend you’ll almost certainly end up writing something derivative. Not only that you’ll probably miss the trend anyway. Don’t forget it usually takes a while to sell a book and then a minimum of a year to go from getting a book deal to being published. Often it’s more like eighteen months. Write what you want to write with conviction and you’ll write it better than if you try to let the market lead you. When I wrote The Year of The Rat, realistic contemporary YA seemed like absolutely the wrong thing to be writing. By the time it came to sending it out to publishers it was just what they were looking for. If I’d tried to write yet another paranormal romance I’d have done it very badly and I don’t suppose it would ever have been finished, let alone published. Reading is essential to writing. The more you read the better you write. Try to read as a writer – if you love what you’re reading try to work out why – is it the characters, the plot? How is the author keeping you interested? If you’re not enjoying it, work out why not. Also allow yourself to get lost in a brilliant book. It seems to work by osmosis. Reading good books makes your writing better. Don’t panic when you get stuck. Everyone gets stuck. 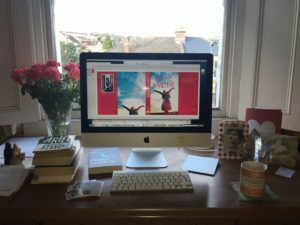 Writing well is difficult, and writing a whole book – well, it’s madness really. What person in their right mind would do it? I found it really reassuring to discover that even the very best writers find it impossible at times. Thomas Mann apparently once said ‘A writer is someone for whom writing is more difficult than it is for other people’. There are different ways of getting through it. Do something else, go for a walk, or move onto the next bit and come back to the bit you’re stuck on, or write something else, or get someone else to read it and make suggestions… Just don’t panic. It doesn’t mean you can’t write. Every writer has been there. If you want to get rich, writing a book almost certainly isn’t the way to do it. If the only reason you’re writing is because you’re planning to be the next J.K Rowling or John Green you should probably give up now. Most writers don’t earn enough to make a living and have to supplement their income. It’s hard work and not generally well paid. Even those who do hit the big time generally spend a lot of time scraping a living first. Also, I believe you have to love writing to be successful at it. If you can, find some other writers to share your work with. Other people can always see strengths and weaknesses in your writing that you can’t. Once you’re published you have an editor to point these things out to you. Beforehand it really helps to have people who are either writers or keen readers, whose judgement you trust, to give you constructive feedback.